Hundreds of Metro and Sound Transit buses will be in service the afternoon of Nov. 23, and the majority will pull over and stop for a brief moment of reflection in honor of Mark McLaughlin, who was killed in the line of duty Nov. 27, 1998, while driving Route 359 - the Seattle to Shoreline run. He was shot and his bus plunged from the Aurora Bridge at 3:20pm. One other passenger died, the shooter took his own life and 32 passengers were injured. “We will always remember Mark McLaughlin’s commitment to public service and the tragedy of how he was taken from us in the line of duty,” said King County Metro General Manager Rob Gannon. 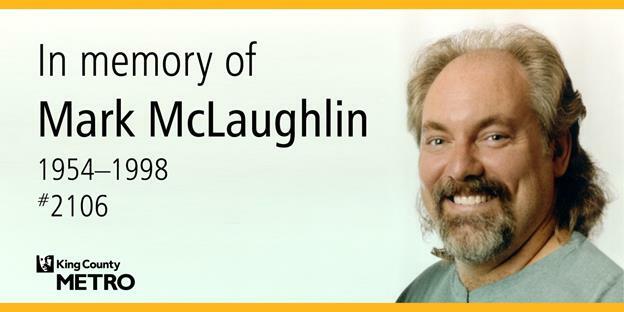 McLaughlin was 44 when he was killed. He joined Metro in 1979 and was a transit operator for 19 years. Coworkers called him a simple, humble man, a gentle giant who was known for handing out bubblegum to his passengers. “I was a recent part-time driver when Mark McLaughlin lost his life in a senseless tragedy 20 years ago,” said Ken Price, President of Amalgamated Transit Union Local 587. Metro created a park in Shoreline and named it for him. See our previous article. Buses participating in the moment of remembrance will stop only where and when it is safe to do so. Buses will not pause service if they are traveling on highways, in the Downtown Seattle Transit Tunnel or on roadways where there is no place to safely pull over. Metro will notify riders via transit alerts and on-board announcements in the days leading up to the moment of remembrance. In publicizing in advance our intent to pause service, Metro also extends its appreciation to riders for respecting and supporting these efforts and assures riders that transit service will quickly restart at the conclusion of the moment of remembrance. 11-22-18 Added link to previous article about Shoreline park named for McLaughlin.